I’m working on issues/projects from understanding the alt-right to media diversity to the transformative power of science fiction. But there’s one thing I keep circling back to…. I’m looking to marry head and heart in my work. I’ve done a lot of very analytical journalism and research. I’ve also had a full life of emotional adventures, including ones which are very internal and others spurred by the world around me — the birth, illness, and death of friends and family; joining tight-knit communities like the Burning Man camp I’ve been a part of for years; traveling around the world. As I look at politics today, I’m digging into cybersecurity and issues like the rise of blockchain currencies; the persistence of issues like voter suppression (and how poorly they’re often covered by the press); and the uses of propaganda techniques in political messaging. All of those require topic-based expertise. 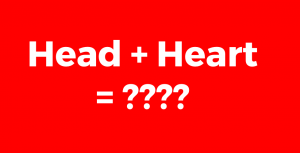 In other words: the head. At the same time, I feel. No, that is not a sentence fragment. I feel a deep sense of appreciation that in these turbulent times I walk with people of of integrity and purpose. I feel anger and frustration that we are re-litigating issues of racial and gender equality we thought we had settled. I feel tremendously lucky to get to witness history, from political conventions to Standing Rock to everyday conversations on the street. I feel saddened not only by the rise of hate crimes and overt hostility in America, but by the sense I get that some people I know are profoundly uncomfortable and even resentful that I will not pretend this isn’t happening. It is. It’s all happening. It’s all happening right now and we need both head and heart to understand this world of ours. Not sure where this will lead me but it’s where my head — and heart — are right now. I wish you the best in your journeys. Note: This essay is not meant to present a unified theory of or definition of whiteness, but to point out that white identity is both a critical pivot point in American politics that remains understudied; and that we are undergoing a crisis of white identity that affects people of all races and ethnicities. As someone who reports on and engages online with white nationalists to this day, I am speaking with as much perspective as my decades of attention to these issues can offer. If you have different perspectives, I would welcome them but ask you reveal how much attention you have paid to the issues at hand. Secondly: this is very long and somewhat discursive – definitely a draft and not a finished document. I welcome your thoughts and comments and will continue to refine it. Get a cup of tea and sit down with me. I hope you’ll find it worth the time. Did I/We Hear the Call to Whiteness? There are many moments from my covering the American electorate this season that, in retrospect, I realize were more significant than I perceived. My editor struck that section from the short liveblog post when voicing concern about how we’d look mounting such a head-on critique of Trump without a passionate Trump supporter, a voice I later found. I don’t blame him for his choice since I didn’t challenge it, and especially since I often write overly-long. I’m not sure if the World War II analogy crossed the line for him because it seemed histrionic. That said, I now view both her statement and my quick acquiescence to our deletion of it as significant. In retrospect, I realize how deeply this woman’s perception of her own whiteness had been challenged by the conversations she was having; and how unwilling I and we were as journalists to foreground this clash over the nationalist call-to-whiteness as part of the political narrative. This horrified mother was staring white nationalism in the face, and it was staring back at her. We as journalists, myself included, did not foreground in our reporting the struggles of white voters who heard and rejected the call. Holding this minor anecdote in mind, know that I will mount an argument below that this election represents a call-to-whiteness to activate white nationalist sentiment; plus a suppression of the importance of this call in discussing our current politics, and a troubling inability to disaggregate the call-to-whiteness from other motivations for voting for Donald Trump. I do not believe all Trump voters are racially motivated or primarily racially motivated, but white Americans, regardless of who they voted for, are now being asked to make an implicit choice in endorsing or rejecting white nationalist agendas and their integration into the body politic. There’s a good argument using a “Cinemax”/cable analogy for the “bundling” of racial animus into every Trump vote, whether or not individual voters explicitly endorsed that. As a reporter with 25 years of field experience in covering both politics and white nationalist movements, I see the two converging in ways we are woefully unprepared to cover or respond to because we as Americans have avoided the topic out of a mix of ignorance, fear, and aversion. I would argue we can avoid it no longer. If you need to understand why the elevation of Steve Bannon and Jeff Sessions, among others, as players in American democracy signals a rise of white nationalism – implicitly and explicitly – then you probably need to do a bit more research on your own before reading the rest of this article. There has been a concerted effort — covert, overt, or both — to keep the narrative of white nationalism, including its violence and extralegal workings — out of the American eye. Much of it, I believe, comes from the inability of media and of many individuals to ascribe racial/group characteristics to whiteness in the way blackness is grouped and tracked, or, in the context of terrorism, Muslim beliefs. If blacks are a group and Muslims are a group judged on the violent behavior of some, then white nationalist violence and terrorism is much more organized and overt but gets less mainstream coverage. The majority of the domestic terrorism before and after 9/11 was by white nationalists and white supremacists, including the Oklahoma City bombing. Timothy McVeigh was a white nationalist who helped bomb and murder 168 people including 19 children in daycare, and was subsequently put to death. And then there are smaller but no less heartbreaking attacks like white supremacist Dylan Roof’s killing of nine people including Pastor Clementa Pinkney at Emmanuel AME Church in Charleston, South Carolina, in 2015. The alt-right is also known to use swatting and doxxing as techniques against people they dislike, disagree with, or turn on. Swatting in particular, used in online gaming feuds as well, can result in violence or threats of violence administered in person by the unwitting first responders who fail to realize this is a deliberate provocation by an unseen hand. And now, their ideological cousins are moving into government, quite likely with an agenda to use the law to increase America’s divides rather than bridge them. This is a hostile takeover of the U.S. government by forces including people cozy with white nationalists. It is profoundly un-American — at least I think so. 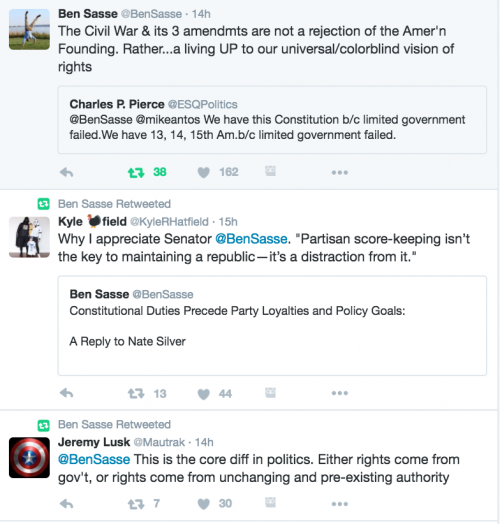 Sasse battled back, Tweeting, “The Civil War & its 3 amendmts are not a rejection of the Amer’n Founding. Rather…a living UP to our universal/colorblind vision of rights”. The fact that Sasse, much to his credit for doing so, needs to say this at all speaks volumes about the depths of disregard for universal human and American rights right now. Let me start with a story that has nothing to do with white nationalism, and everything to do with survival. One time, when I was in Guatemala for three weeks doing an immersion program in Spanish, I was walking home alone after a night drinking with other students. It was a safe town near Lake Atitlan, and all of us were doing homestudies with different families. I wasn’t worried about being attacked by a human. The road to my host family’s house ran parallel to the lake, which was about 300 yards away. As I walked down the road, with its shuttered and gated houses, I saw out of the corner of my eye two dogs way down by the river. They scented or saw me and I saw them break into a fierce run, the equivalent of a horse’s full gallop. I had no possibility of outrunning them and no obvious place to hide. So knowing what I do of dog behavior, I kept walking slowly and steadily. Sooner than I would have liked, but just as expected, the dogs were around me, snapping and snarling. I did not make eye contact. I kept walking slowly and intently toward the side street that would take me home, with my eyes fixed on a streetlight. And after a time – how long, I will never be sure – the dogs stopped snarling and went away. I did not act like prey. I did not act like a threat or challenge their dominance. I got home with nothing more than a bad scare. But I can still remember that night vividly – the lake to my left, with scrub and rushes leading the way to the waterfront; the dark pierced by the street lights and the moon; the vector of the road that the animals sprinted down, and how I could not even afford to keep my eyes on it directly but had to peer out of the corner of my eye as I prepared to react to the threat. I remember because my life literally depended on my perception of and reaction to the threat. Sometimes it seems like the call to American whiteness we’ve seen during this election is like the attack of those dogs: a sudden onrushing of power and energy and threat. Though it seems counter-intuitive, the best first action to take is often to remain very calm and still. No, I am not comparing white Americans to dogs. That should be obvious but in our heightened times is not. I am comparing the pack mentality of the nationalist call-to-whiteness to the ferocity of these animals. We are seeing that pack mentality in operation right now. Better late than never we must examine the pack mentality; emphasize why white Americans must awake to what’s being invoked in their names; and also why the reactions of the broader white community to “extremist” constructions of whiteness will help determine the future of our nation. I’ve been covering white nationalists and supremacists in person for more than two decades. I once met Klanspeople in a blizzard to get part of a larger story about women in the white supremacist movement. The Klan is, perhaps, the ceremonial figurehead of white supremacy but hardly the most powerful influence and considered quite outdated by today’s digitally sophisticated nationalist alt-right. At the time I did that investigation of female white supremacists in the 1990s, I spoke by phone with a woman from a dysfunctional wealthy family who had run off to join the violent Aryan Nation, a group that was later bankrupted by civil lawsuits for violent assault. The woman described how her family, which was part of the Social Register, so turned her off with their lack of regard for nurturing their own children that she sought out a new family in white supremacy. The woman from the Aryan nation also explained something that would stick with me throughout my reporting career. I asked why she would grant me an interview, and she said that a fraction of the people who read the article would be persuaded to her cause, and that was reason enough for her to grant an interview to someone she perceived as hostile to her white supremacist mission. While depressing in some ways, the knowledge of her views about how media would affect her recruiting – which I have come to believe as well, as an inevitable cost of doing the reporting I do – was enlightening. After that point, I rarely feared whether people who perceived me as hostile to their racial separatist, nationalist, or supremacist interests would grant me an interview, and I have found that to be the case. Can You Be Objective If You Can’t See Whiteness? Since then, I have continued to study whiteness as part of my reporting on American politics and culture. It has seemed a particularly important part of my work, and frankly, one that is sometimes viewed with suspicion by my own journalistic peers, as if studying something makes me unqualified to understand it rather than particularly qualified to do so. It also gets to an ongoing debate in journalism over objectivity. I admit I am not neutral about race, racism, or white supremacy. I do not believe that disqualifies me from reporting on it as long as I am fair to those I report on. I have always found a common human bond with white supremacists I have reported on. I do not view them as demons; more as lost, confused, and sometimes dangerous cousins. I see whiteness in ways that my white colleagues often seem to ignore, as if it cannot be seen at all. In my experience the white people I’ve met that seem most attuned to the power struggle over American whiteness are immigrants and people who grew up as working-class white Americans and moved into other circles where they were judged as different from established or powerful white norms. One friend had grown up largely in France but partly in central Florida, and he understood and acknowledged the layers of meaning people ascribed to him was different in both places. I also found common cause with people who moved to big cities and found themselves thrust into new American cultures, often Americans from rural or exurban areas. I found their “double consciousness” familiar and comforting, as it was an analogue to my own. As context for how I do the work I do, know my childhood shaped my journalistic pursuits. First, there’s the fact that my parents were both journalists at different times and met at the graduate school of communications at Syracuse University before moving to Zambia to start a newspaper. In that sense, reporting is in my blood; but the way I perceive race was also seared into my consciousness by a childhood dis- and re-location both physical and metaphorical in nature. The summer before I entered first grade, my family moved from Central Park West and 100th street to a virtually all black neighborhood in Baltimore. In New York, my friends were not just black or white. My best friend was half black and half Jewish; my extended friend circle included Cuban-American girls who were clearly Afro-Cuban, but who were not asked to choose a side in the black/white dichotomies of American racial taxonomy. My friends were blond and Asian and black and it was all very Free to Be You and Me. When we moved to Baltimore, to a tree-lined street of 1920s and 1930s wood houses near the city line, I was plunged into a world where there was only blackness and whiteness, and the two were engaged in a fierce cold war. My sister and I were suddenly chided or rewarded by other black people for “speaking proper” and viewed as small Martians by white Americans. Everyone, regardless of race, was confused as to how I could have an African father – a real actual African man with an accent and a PhD! I’ll spare you an endless string of anecdotes about moments when I understood how much and how differently I was being observed by others in my new city. This dislocation/re-location meant that by the age of six I had laid out some of my fundamental principles and psychology that remain with me today, and have shaped my perspective as a journalist. First, I came to believe that humans lived in “reality zones” with quite different rules about identity, fairness and achievement. Inside each of these zones was an internally consistent reality, but as one crossed barriers of geography, class, culture, religion and race, the rules changed entirely. Second, that whiteness, which was inconsequential to my early childhood, was of the paramount importance to understand. Third, that I was able to cross these worlds and remain self-aware of how I was being perceived; and that usually it was not in my best interest to reveal that I understood how others were viewing me, because it made others uncomfortable. If I made people aware that I was observing their construct as intently as they were observing me, that made them observe their own construct in new and discomfiting ways. So I remained friendly and engaged on the outside (and inside) while keeping the more piercing aspects of my cultural studies to myself. Fourth, and most importantly, coming from the above: that whiteness could be observed, even in fearful times, if one got close enough and stayed relatively silent. I have spent this election observing politics, race, and the rise of a particularly passionate, disruptive, and dangerous form of white nationalism. As people look at the outcome of the election, we are left with questions about disaggregating political behavior like voting from intent. Given the rise of white nationalism and its integration into our government, was Ted Cruz simply not Anglo enough to be a viable candidate for president? Was Jeb Bush’s marriage to a Mexican woman part of the reason he was viewed so tepidly by Republican voters? These are questions we probably didn’t measure for at the time – and if there is research on the matter, please let me know – but in retrospect I really wish we had. I have also not been afraid to see Trump voters for who they are, in their many forms, and realize that what I know so far, despite my reporting, is simply not enough. In some ways, the real work of understanding motivations and disaggregating voter intent and how the message hit the target is just beginning. The other day I sat across from a woman on a crowded Amtrak train at one of their four-tops. She was black, or appeared so to me, though she later emphasized on an exceedingly loud and profanity-filled phone call that she was Brazilian (which I mention simply because she seemed to be distancing herself from American blackness in the remarks). She was wearing clubwear (kitten ears; revealing hyper-sexualized gear in more of an electronica/post-punk mode than anything vaguely hip hop); mentioned she was a bartender; and when she wasn’t on the phone spent the ride hitting on a baffled Asian-American businessman next to her and generally being an enlightening (to a reporter like me) nuisance on the train. Before I moved away to get some ear-space from her aggressive monologue on the phone, I learned that she was a Trump voter; she and the friend on the other line were mocking non-Trump voters; and she saw her vote as a flag planted squarely in the center of her identity. What I learned from her conversation made me think: maybe this woman thought of Donald Trump as representing freedom. And what’s more American than that? She didn’t want to be put in a box, and as she and her friend apparently mocked non-Trump voters, her rhetorical emphasis was on what a maverick her vote for Trump made her. Hillary Clinton, for all else you do or don’t think of her, was committed to an establishment path to power. Donald Trump, vulgar by his and his family’s own admission, clearly spoke to this woman on a personal level. On some semiotic levels, Trump functions as an American antihero, someone who gives people permission to imagine themselves as just as vulgar and just as powerful, and winning not despite their vulgarity but because of it. Listening to this young voter put together one more puzzle piece of the many reasons people, including some people of color, voted for Trump. And I have to confess, Donald Trump has been liberating to me too, in one sense. If a man who has settled out of court on charges of educational fraud and racially discriminating in housing can be our next white male President, I double down on my rejection of the conceit of exceptional blackness, aka “better than” syndrome. The demanded performance of exceptional blackness is a pernicious part of the construct of American meritocracy. By “exceptional blackness” I mean the idea that blacks not only have to work twice as hard as whites, but specifically that doing so means we will be liberated from discrimination and transcend race. I may be better than white peers sometimes; and I at other times I will not be; but that alone will not change the construct of race in America. But if Donald Trump can be president, then I can at least be black and free. Be clear that what I am rejecting is not the urge for excellence or self-improvement, but the idea that my excellence and self-improvement is a blood price I must pay to prove black Americans’ worthiness of a true meritocracy. You either believe in working toward a true meritocracy or you do not, and I will not bribe you into belief by my individual performance. Are you for equality, or are you not? In many ways, the white nationalist crowd is calling out the lie of American meritocracy from its own admittedly ideologically bent perch. In my conversations online and off with white nationalists, they admit a reliance on the law to enforce a dominance that they then also claim a birthright to. When a self-described white nationalist and other members of the alt-right I was in conversation with on Twitter claimed America was a white nation, I pointed out that blacks have been in Virginia since the mid-1600s, and that the founding of Santa Fe, New Mexico, the nation’s oldest capital city in 1610, indicates that the oldest non-Native Americans in our current geographic configuration were Latino (Spanish; indigenous, and mixed) and not Anglo Saxon white. I learned almost nothing of Native American culture in k-12 education or college, and it took reporting from Standing Rock to make me dig into things like land rights, genocides, and American treaty law, including the US Supreme Court case United States vs. Sioux Nation. I am not immune to being aware not of what is important but what I am exposed to, which is one reason why keeping people siloed has such a powerful effect on society. The person then admitted that America was not truly founded as a white nation, but that laws made it so. Their claim to a white homeland is better understood, then, as a claim to their right to use the law to protect their dominance when neither history nor meritocracy is on their side. This is similar in result to European white nationalism, but with an origin story more like the claim of South African Boers to lands, which provoked the clash of power known as the end of apartheid. White Afrikaaner nationalist calls for a volkstaat, or white homeland, persist to this day. Their admission that the law must be leveraged to protect white dominance in America also indicates a profound fear of erasure – returning to the idea of the dilution of the white race cited by the woman in Las Vegas – and a fear of a true meritocracy. For all the criticisms of welfare and entitlement programs, whiteness has been the biggest wealth-building and land-grabbing entitlement program in America. The white nationalist stance on American meritocracy should be extremely troubling to what I call “establishment whiteness,” a construct that believes that evocations of whiteness by and large do not challenge the access to advancement of other people. These white nationalist claims explicitly reject the “post-racial” and “color-blind” putative politics of establishment whiteness. As a journalist, after all these years of reading headlines about the crisis of American blackness, I must ask when are we going to see an equal number of journalistic explorations about the crises of both American whiteness and global whiteness? (The far-right National Front party in France has taken a once-unthinkable polling lead in the upcoming elections, and I have written about the rise of Europe’s far right parties here.) Isn’t it about time for a serious and sustained inquiry? I have learned as much about whiteness as I have because it was critical to my survival and my personal, intellectual, and professional development. The question I have now is whether white Americans feel they have a stake in understanding whiteness as well. For this call is being made in all white Americans’ names, and to claim you are a bystander is a dangerous thing to do. This is a culture war, and as in all wars, bystanders are likely to be bloodied in the melee. American whiteness, when activated in this particularly aggressive nationalistic way, will be worse for me and my family than it will be for many white Americans. On the other hand, I am well prepared for this moment in time. Based on my upbringing and my field studies on the world, I never presumed America was a safe place for me, although I love this nation dearly. I have studied the geography and culture of America as intently as I have studied whiteness. I am going in December to cover the Dakota Access Pipeline protests, and on that trip I intend to visit both North and South Dakota, which will complete me having visited all 50 of the U.S. states. I have family by marriage in South Dakota, and if the fates are willing I will see them on this trip. As I remain in the adoption pipeline, and my life will change dramatically once I have a child, I hear the everything-ness of America calling me to an adventure, perhaps the last one of its kind for a while. This is my land, and no white nationalist will tell me otherwise. However, I do believe in their ability to harm me and my nation. If establishment white Americans do not recognize the challenge that the call-to-whiteness presents to their lives as well as to mine, my struggles and our nation’s struggles will be materially more difficult. But I can’t determine anyone else’s actions, only my own. It thus remains very much up to white America to control the baser urges of the call-to-whiteness. You are not above it, particularly if you have not bothered to learn about it — and especially if you claim it doesn’t exist or doesn’t concern you. The call-to-whiteness is being invoked in your name. Can you hear it now? And how will you respond? The world is waiting to know.